What is National Inclusive Education Month? National Inclusive Education Month is a time for members of the Community Living movement and its many partners to promote and raise awareness about inclusive education. To highlight inclusive education – to define what it is and how the development of inclusive schools and inclusive school practices helps provide quality education to an increasingly diverse student population, including students with an intellectual disability. To provide educators, students and parents an opportunity to share ideas on strategies to enhance inclusion and successful school experiences for every child. 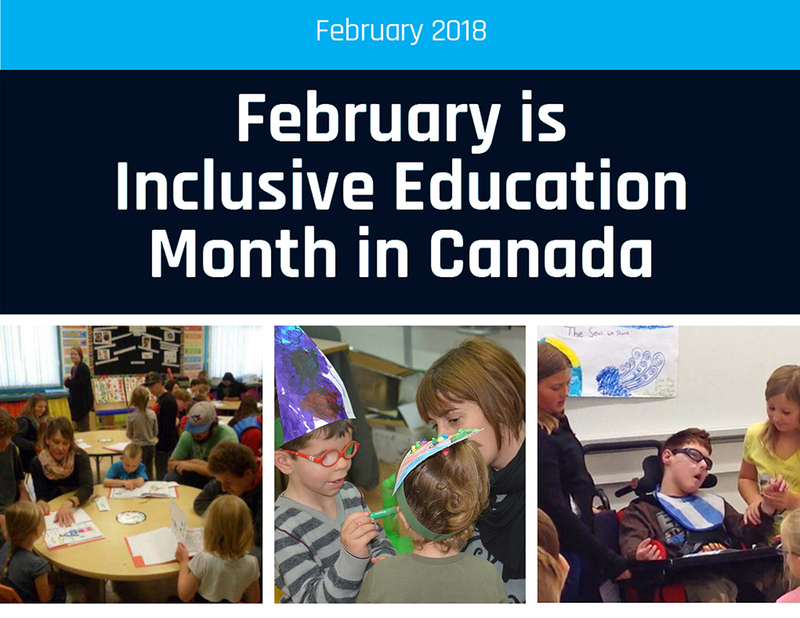 To acknowledge and recognize the commitment and effort of teachers, administrators, students, and families who contribute to successful inclusion of students in schools and classrooms throughout Canada. Among the activities are workshops and information sessions, media stories on the efforts of teachers, parents and students, and recognizing outstanding achievement through awards. To highlight National Inclusive Education Month and to bring attention to the many positive examples of inclusive classrooms and schools across the country, CACL created a national certificate of recognition to be bestowed upon recipients, selected by Provincial/Territorial Associations for Community Living, who have made positive contributions to inclusive education in their province or territory. In partnership with the Alberta government and the Alberta Home and School Association, the Alberta Association for Community Living developed an inclusive education poster that was distributed to every school in Alberta. Community Living Ontario presented a series of education stories on its website throughout the month. The New Brunswick Association for Community Living held a ceremony to present two National Recognition Certificates in Fredericton, with the Minister of Education taking part in the event. Share your activities with us and we could post them on our Facebook and Twitter pages. Email your stories to inclusiveeducation@cacl.ca.